Start off your visit on the 28th (Mon): pause for some photo ops at 9/11 Memorial and then explore and take pictures at Central Park. On the next day, explore the world behind art at The Metropolitan Museum of Art, don't miss a visit to Times Square, and then take in panoramic vistas at Empire State Building. Manchester, UK to New York City is an approximately 11-hour flight. You can also do a combination of flight and bus. Traveling from Manchester to New York City, you'll gain 5 hours due to the time zone difference. Prepare for somewhat warmer weather when traveling from Manchester in October: high temperatures in New York City hover around 24°C and lows are around 16°C. Finish up your sightseeing early on the 29th (Tue) so you can travel to Disney. Disney is a town in Mayes County, Oklahoma, United States. Kick off your visit on the 30th (Wed): take an in-depth tour of Afton Station Packard Museum, stop by Zena Suri Alpacas, and then take advantage of the amenities at Shangri-La. To see other places to visit, maps, photos, and other tourist information, read Disney trip planner . Use the Route module to find suitable travel options from New York City to Disney. You'll gain 1 hour traveling from New York City to Disney due to the time zone difference. Plan for slightly colder nights when traveling from New York City in October since evenings lows in Disney dip to 12°C. Wrap up your sightseeing on the 30th (Wed) early enough to travel to Los Angeles. Change things up with these side-trips from Los Angeles: Anaheim (Disneyland Park, Disney California Adventure Park, & more). Pack the 1st (Fri) with family-friendly diversions at Universal Studios Hollywood. And it doesn't end there: see the interesting displays at The Getty Center, take in the waterfront at Santa Monica Pier, explore the world behind art at Los Angeles County Museum of Art, and get outside with Self Realization Fellowship Lake Shrine Temple. For photos, more things to do, other places to visit, and other tourist information, use the Los Angeles trip itinerary planning app . The Route module can help you plan travel from Disney to Los Angeles. 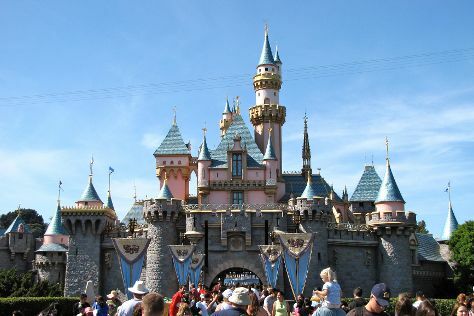 Traveling from Disney to Los Angeles, you'll gain 2 hours due to the time zone difference. Traveling from Disney in October, things will get a bit warmer in Los Angeles: highs are around 32°C and lows about 19°C. Finish your sightseeing early on the 8th (Fri) to allow enough time to travel back home.